In an emergency, dial 911 on any conventional or cellular phone along the Big Sur coast. 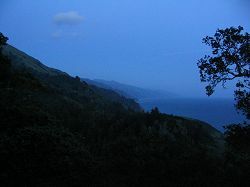 The Big Sur area is served by 24-hour emergency response units. Big Sur Chamber of Commerce: This organization promotes tourism in the Big Sur region and supports Big Sur regional businesses and services. Ventana Wilderness Alliance: This nonprofit organization's mission is to protect, preserve, enhance and restore the wilderness qualities and biodiversity of the public lands within California's northern Santa Lucia Mountains and Big Sur coast. The Big Sur Land Trust: This nonprofit organization's mission is to conserve the significant lands and waters of California's Central Coast for all generations. Monterey Bay Sanctuary Foundation: This non-profit organization seeks to advance the understanding and protection of the Monterey Bay National Marine Sanctuary. 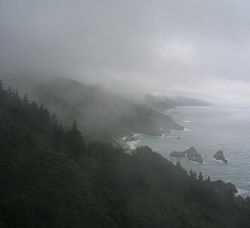 This sanctuary, which extends along the entire Big Sur coastline, was designated in 1992 to protect unique marine resources along the Central California coast. Some lodging providers may permit dogs and other pets in some of their rooms or cabins. Ask each provider what is available. Contact the California State Department of Fish and Game (831.649.2870) for regulations and season dates, which may change frequently. All anglers 16 years of age and older must have a valid California Fishing License in their possession while fishing. See this Guide's list of fishing locations in the Big Sur region. 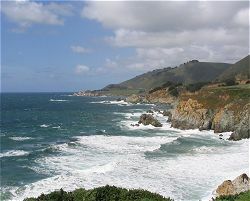 The Big Sur region is a popular location for weddings. If you'd like your wedding to be in or near the Big Sur Valley area, the Big Sur Chamber of Commerce can be helpful in locating facilities, personnel, and services for you. You can obtain a California marriage license in the city of Salinas [ county recorder Web page ], in the city of San Luis Obispo [ county clerk Web page ], or in other public facilities in the state. KUSP-FM, a community radio station based in Santa Cruz, provides (by means of two repeaters) the only broadcast radio signal available in much of the Big Sur region. From Carmel Highlands to Point Sur and in Palo Colorado Canyon (including Bottchers Gap), KUSP-FM can be heard at 91.3 FM. In the Big Sur Valley area and south as far as Gorda, it can be heard at 105.9 FM. You can listen to KUSP-FM's streaming audio feed from anywhere in the world. Pelican Network: a network of community groups and people who care about natural and cultural history.